Last year, I was taking a walk around my neighborhood when I noticed a few landscaping stones in a ditch by the side of the parking lot. 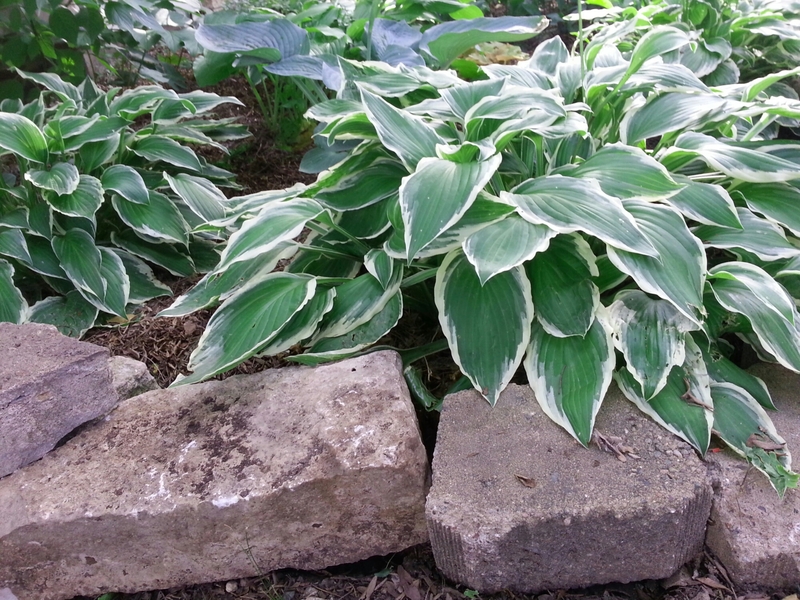 By landscaping stones, I mean those huge, 20-40 pound pieces of limestone that have been cut flat on the bottom and top so they can be used to build garden walls, bench supports, and so on. When I investigated, I found that there weren’t just a few stones. There was practically a quarry there, hidden under potting soil, dead plants and lawn clippings that had also been thrown into the ditch. I asked around to make sure it wasn’t anyone’s secret hidden stash. Nope. People who lived near it had just taken to throwing things down there that seemed to bulky or organic for the trash. I used a few of the stones to border my garden out front, but didn’t have a need for a whole quarry’s worth, so left most of them where they were. If I ended up needing them later, I knew where to find them. And if someone else got to them first — well, good. At least they would be used, rather than clogging up the ditch. They came in handy this week when I was weeding the neighborhood hosta garden and trying to come up with a border solution to keep kids from biking through it. The garden had a border made of small, 5 pound rocks that the older kids regularly bike through and over because they can. 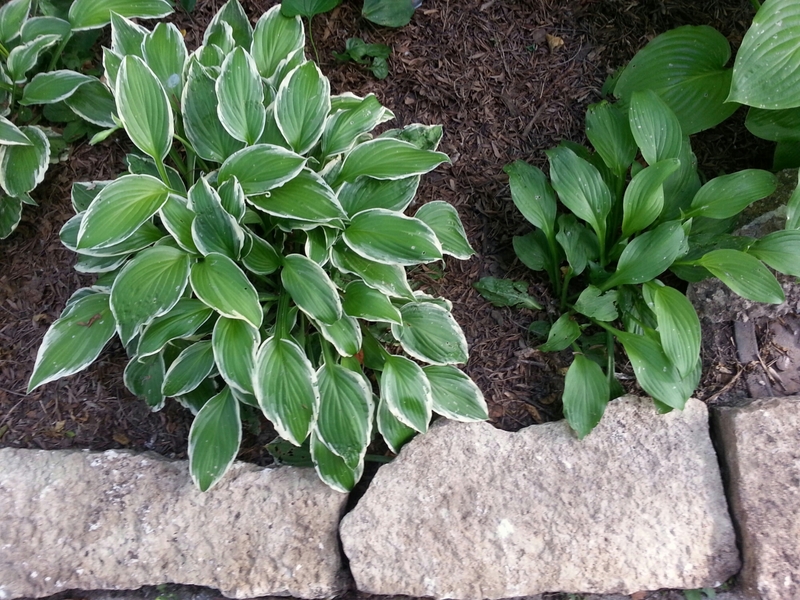 After 5 or 6 trips to the ditch with my garden wagon, the hosta garden had a sturdier border. And I’d had the equivalent of a month’s worth of strength training workouts. Who needs the gym when you have a garden to attend? The new border is at the bottom of the photo. 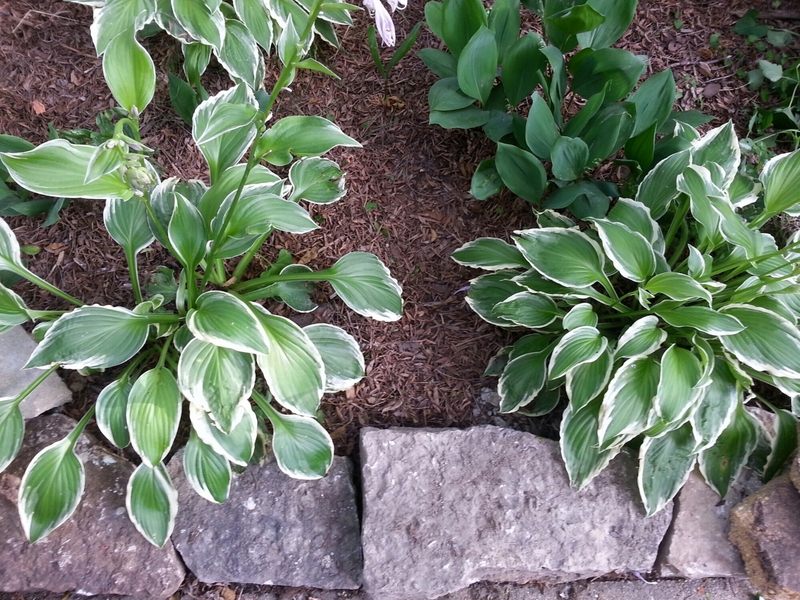 The pile of small rocks and bits of concrete under the big-leaved hosta made up the old wall. That triangle is about 18″ on the top side. There were a few concrete “stones” among the limestone. They made good corners.